The Safety Centre take great pleasure in announcing the arrival of our new range of Firechief Chrome CO2 Fire Extinguishers. These units are available in a 2KG and 5KG size and are ideal for use in areas which are design led. This Chrome CO2 Fire Extinguisher range is ideal for maintaining an aesthetically pleasing finish to a building. Both sizes of Chrome CO2 Fire Extinguishers come with a manufacturers 5 year warantee which gives peace of mind that the device is built to last. There are designed and built to comply with the requirements of BSEN3 (Excluding Clause 16.1 – red coloured body) and feature the same impressive build quality as the rest of the popular Firechief brand. Both the two sizes of devices available feature an impressive fire rating. The 2KG size boasts a 34B rating whereas the 5KG version goes all the way upto a 89B rating. This gives a specifier peace of mind that the extinguishers are capable of being used in a fire situation. The 2 KG version features a frost free swivel horn which can be adjusted to point in the direction of the fire, whereas the 5 KG versions horn is on the end of the hose which gives great control of the direction of the extinguishant. These devices are suitable for tackling both Class B (Flammable Liquid Fires) and Electrical Fires. 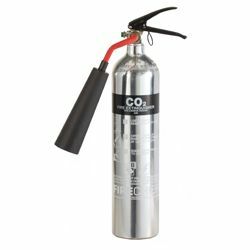 Carbon Dioxide Fire Extinguishers are ideal for office environments where electrical fires may occur. Both water and foam type fire extinguishers are not suitable for use on electrical fires, so it is good practice to install CO2 type extinguishers. If you’re interested in this product you may also be interested in our C-Tec 800 Series Call System and Wireless Disabled Toilet Alarm ranges.